Wally’s Answer: Using a VPN to securely connect to a remote computer is how many people log-into their work computers. When it comes to Windows 8 its usually the third-party software that is still lagging behind but this seems to be changing fast. Although many people have had no Windows 8 VPN connection problems some have experienced problems due to firewalls and internet security software. Cannot connect to remote network using VPN from a Windows 8 computer. Cannot connect to host server or ping IP addresses (timeout error). It might have been caused by an anti-virus program. Might be due to a third-party firewall. It seems that the Windows 8 VPN Connection problem is caused by third-party firewalls running on Windows 8. This problem did not occur with Windows XP and Windows 7 because developers have gotten used to those platforms. Windows 8 is still relatively new and it seems that developers have some catching-up to do when it comes to firewalls for Windows 8. Try using the built-in Windows 8 VPN without the third-party firewall or anti-virus running. Open the Control Panel. Press the Windows Key to go to the Metro Screen > type control panel > Press Enter. 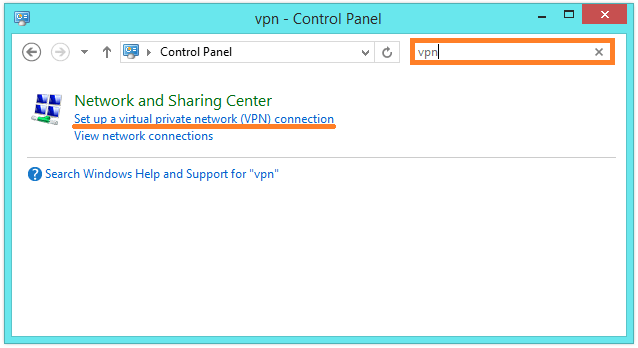 In the Control Panel window click on the search bar and type vpn. Click Set up a Virtual Private Network (VPN) connection, and follow the setup wizard to set-up your vpn connection. Open the charms bar by swiping from the right side of the screen (in a touch screen), or using the Windows Key + C key combination. 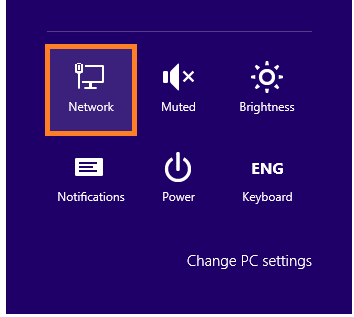 Select Settings and select the Network icon. In Networks select a VPN connection and select Connect.